When choosing roofing materials, it may seem that you have an infinite choice of any material on the market: asphalt, composite, metal, wood shake, rubber, and MSR rolled roofing. Many people imagine that the choice is purely an aesthetic or economic one—that you pick a roofing material purely according to what you like or what you can afford. Not so. Many factors determine which roofing materials you can use, and one make-or-break factor is the slope of the roof, known as roof pitch. For example, you may think you want classic composite shingles on your roof, but if the pitch is below a certain ratio, you may be forced to install a different type of roofing—perhaps rolled roofing or standing seam-metal roofing. Pitch is the term used to describe the angle, slope, or slant of your roof. Roof pitch designations are comprised of two numbers indicating a ratio. The ratio can be indicated by a division slash separating the numbers, such as 2/12 or 7/12. Or, colon can replace the slash, as in 2:12 or 7:12. Either way, the notation designates a ratio between two measurements of the roof—a numerator and denominator. Numerator: The numerator, or first number, refers to the vertical (height) measurement of the roof. Denominator: The denominator, or second number, denotes the horizontal (length) measurement of the roof. To make things a bit easier, for roofing purposes the denominator is always 12. Even though basic mathematics tells us that 12/12 can be reduced to 1/1, this is not done with a roof pitch. The denominator remains 12. The pitch of a roof is nothing more than a ratio that indicates how much rise there is in the roof over a 12-unit horizontal distance. 5/12: For every 12 horizontal feet, the roof changes 5 feet in vertical height. 8/12: For every 12 horizontal feet, the roof changes 8 feet in vertical height. For most home styles, roof pitches fall in a range 4/12 (a moderate) slope up to 8/12 (fairly steep). Examples of extreme slopes range from 1/4/ 12 (almost flat) to 12/12 (sloping down at a perfect 45-degree angle). Low-pitched: It was fashionable for modern-style homes built in the 1960s to have little pitch, just a barely negligible slope to help drain water. Visually, this roof appears flat. This pitch might be as low as 1/12. 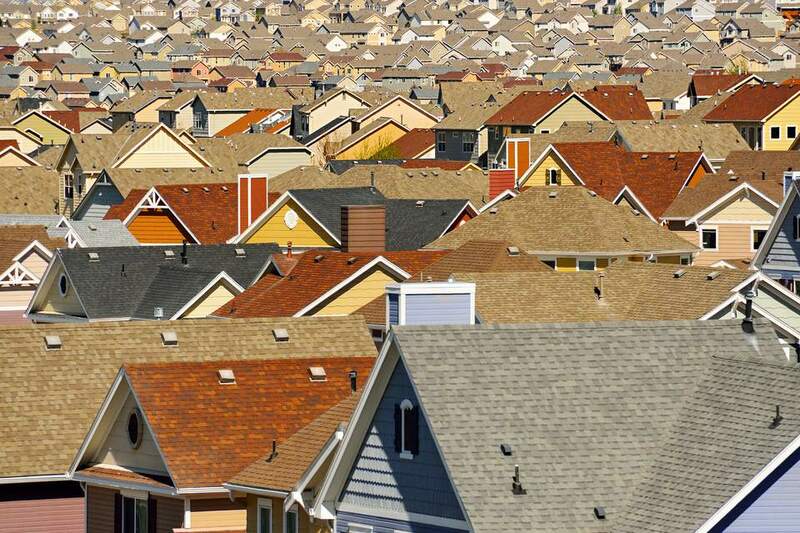 High-pitched: Roofs on Victorian-era houses were often sharply angled with a steep pitch. Think of a classic Addams Family haunted house, with its soaring peaks, and you have a picture of a high-pitched roof. This is one of the rare pitches where the numerator is greater than the denominator, with a slope as high as 18/12. Built-up roofing: Sometimes called tar-and-gravel, or BUR, the modern form of this kind of roof consists of alternating layers of bitumen and reinforcing fabrics. "Torch-down" roofing: This is a single layer membrane-style roofing material that is heat-activated by a torch during installation. Rubber membrane: EPDM (short for ethylene propylene diene monomer) is a true rubber that can be applied to a roof with glue or mechanical anchors. Standing seam metal: These roofs are made from panels of aluminum or steel joined together in raised seams. They can be used on roofs with pitches as low as .25 /12. They are also used on much steeper roofs. Clay or cement tiles can be used on a wide range of roof pitches. For pitches of 2.5/12 up to 4/12, the roof requires double underlayment. Slopes above 19/12 are not recommended, since tiles on very steep roofs can rattle. A great many residential roofs fall into this category. The roofing materials most often used for these pitches include asphalt (composite) shingles: Traditional 3-tab shingles made with asphalt composite are the most popular type of shingle and are the most flexible in terms of adapting to many roof pitches. These shingles are appropriate for pitches as low as 4/12 pitch, all the way up to a 12/12 pitch. Think of them as taking the middle road in terms of roof pitch—not too flat, not too steep. Wood and slate shingles are used in many of the same types of roofs as asphalt composite shingles, but may not be appropriate for roofs near the lower end, since they are more susceptible to leaking. Wood and slate shingles do not lock together as tightly as other types of shingles. Most roof materials have a recommended pitch range for which they are most appropriate. The rules can occasionally be broken, but generally you should not exceed the low range of the recommendation. For example wood and slate shingles might work for roofs steeper than the top recommendation of 12/12, but you should not install them below the 4/12 lower range.